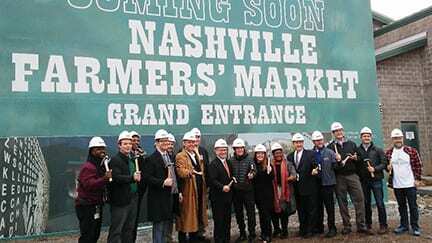 NASHVILLE, TN — The Nashville Farmers’ Market is breaking ground on a series of renovations to update and expand the facility in a project titled “Growing Together.” Major components of the expansion include the Fresh Savings Program, a new grand entrance at the north side of the market facing the Tennessee State Museum, additional leasing space, a new waste center and an urban farm and artist residency program. Additionally, $1.2 million from Metro Government funds are going towards replacing the heating and cooling system. The project will feature a public art installation at the grand entrance, along with an artisan kiosk program that provides retail space to local artisans to display their work. “We are reimagining how we utilize the space here at the market,” said Nashville Farmers’ Market Executive Director Tasha Kennard. The renovation will add 3,000 square feet of new leasable space, half of which will be devoted to classroom and meeting areas and the other half to retail space inside the market. The multi-year leases are part of a five-year revenue plan that will cover the market’s operational needs. A new waste center will also be constructed on the south side of the market where customers can drop off recycled goods, and the current waste site will be turned into retail space that will connect with the farm sheds. Recycling and compost stations will be added throughout the market in an effort to become a zero waste facility by 2020. The Fresh Savings Program will also be expanded, with many of the new farmers and vendors partaking in the initiative that allows visitors to purchase goods with an EBT card. The market then matches $20 for every purchase made. Seventy percent of the contractors working on the renovation are women, minority and veteran owned companies including Gould Turner Group, A&S Electric, Inc. and Maxwell Roofing. Kennard worked with the procurement office at Metro Government to hire these businesses. Two local farms will house part of their operations at the market. Rally House Farms will use hydroponic methods to grow lettuce and herbs, while Bass Farms will build an onsite greenhouse to harvest microgreens. The market will remain open during renovations.